Haverim - News / WORD WAS IN THE BEGINNING ! WORD WAS IN THE BEGINNING ! 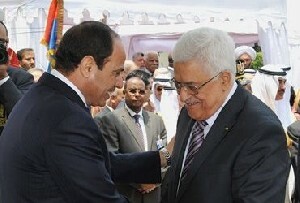 A new diplomatic initiative presented by the Egyptian President A-Sisi to the head of the Palestinian Authority Mahmoud Abbas – behind which also stands the United States – proposed to increase the area of Gaza by five, by extending it to Sinai Peninsula territory, establishing an independent Palestinian State, there. According to the plan, the Palestinian cities in Judea and Samaria will enjoy autonomy, and in return, giving up the demand to return to the 1967 borders. President of Egypt, A-Sisi, presented a proposal for establishment of a Palestinian State in the Sinai Peninsula to the Head of the Palestinian Authority, Mahmoud Abbas – this was reported this morning (Monday) on the IDF Radio, Galey Zahal. According to the report, the plan has been in development for several weeks now, but was only presented to Abbas in a meeting held the day before yesterday in Cairo. The proposal includes an Egyptian offer to give the Palestinian Authority 1,600 square kilometers of its land, adjoining the Gaza Strip, and creating a Palestinian State there. As part of the plan, the Egyptian President, basically suggests to turn Gaza into an area five times its current size. The Palestinian refugees are to return to the state, which would be demilitarized. In addition, according to the Egyptian proposal, the Palestinian Authority will get autonomy in the West Bank cities – and in return, Abbas will give up the demand to return to the '67 borders. According to the sources who gave the details, President A-Sisi put a lot of pressure on Abbas to take the offer, but he outright rejected it. One of the pressure levers was the American involvement, that gave a green light. Apparently Prime Minister Netanyahu was also updated on the details of the proposal. The surprising plan is not due to the ingenuity of A-Sisi – a similar proposal was brought up eight years ago by Israeli academics, as well as the former head of the National Security Council, Giora Eiland. Back then, it was the Egyptian government that flat-out rejected the proposal. IN RUSSIAN: "Gaza-Sinai as an Israel-Egypt Silicon valley"